These resources can be used in a variety of lessons including whole group instruction, literacy or word study centers, or as I use them, for small group special education. •	Print black and white copies for students to write on, and/or print a few colored copies, then laminate them, and they can use a dry erase marker to complete the graphic organizer. •	You can also use these to differentiate instruction. As some of your students may only be able to draw a picture, others may be able to write a sentence. 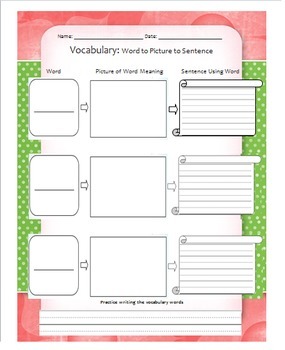 Also see Word to Picture to Sentence Graphic Organizer and the FREE document that gives suggestions on how to use these resources.